Fruit Logistica Opens Today in Berlin: "Most International Logistica Ever"
Read more about Fruit Logistica Opens Today in Berlin: "Most International Logistica Ever"
As China celebrates the second day of the lunar New Year, the 2019 edition of Fruit Logistica, the world's largest fresh produce industry trade exhibition and hub for Europe's produce industry, kicks off today at the Messe Berlin fair grounds in Berlin. The show features more than 130,000m2 of floor space and exhibitors from every sector of the global fresh fruit and vegetable industry. Over 3,200 companies are exhibiting at the show, and visitor numbers are expected reach roughly 78,000, according to Fruit Logistica Senior Product Manager Madlen Miserius. This year's exhibitors are from 90 different countries, meaning, "this will be the most international Fruit Logistica yet," said Miserius. As usual, dozens of concurrent informational events during the show will dig in to a range of topics, from technical briefings to trend reports to product tastings and product launches. The Fruitnet World of Fresh Ideas conference held yesterday set the stage for Fruit Logistica, with presentations of a range of topics such as a new robotic strawberry picker, the latest advances in reefer shipping, the outlook for Brazil's fresh produce market and global avocado production, trade and markets—among many others. 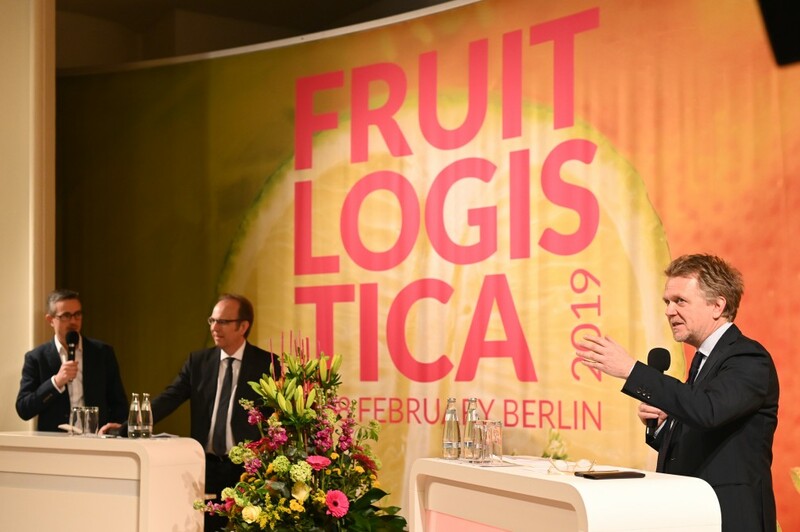 The Fresh Ideas conference also served as preview for the Fruit Logistica Trend Report 2019, which will be available for download at the Fruit Logistica website from today at 10am, Berlin time. Fruit Logistica opens as the European fresh produce industry anxiously eyes the March 29 Brexit negotiations deadline. The worst-case scenario of a "No-Deal" Brexit would be, "catastrophic for the supply chain of fresh produce," said Nicole Visbeen, CEO of Daily Fresh Logistics in the Netherlands, which sends around 150 to 200 truckloads of Dutch produce to the UK every day. She added that a No-Deal Brexit would lead to severe fresh produce shortages in the UK, which imports roughly 30% of its fresh produce from the EU. But despite the looming potential Brexit calamity, the show must go on. Following are some of the events and features to look out for at Fruit Logistica 2019. This year, organizers have put a special emphasis on suppliers of organic foods and convenience-focused products with the "Organic Route" and "Convenience Route", marked by special symbols that can help visitors to find exhibitors offering these two product categories. Organizers stated that, "according to a study conducted by Zion Market Research, worldwide sales of organic foods are expected to nearly triple by the year 2024, reaching a total value of $323 billion. Organic fruit and vegetables will constitute a large share of this increase. The same applies to the fresh convenience product segment, where convenience foods in general are expected to see an increase in revenues. The Asian market in particular has experienced rapid growth over the past years. China and India recorded revenues of over $20 billion. But the USA remains the global frontrunner, with revenues of over $40 billion. In Europe, the UK in particular is focused on ready-to-eat foods. But the consumption of convenience products has also increased in Germany, with revenues of $6 billion in 2018. This corresponds to a per capita consumption of over 70 kg." More information about the "Organic Route" and "Convenient Route" can be accessed from the Exhibitors section of the Fruit Logistica website main menu. This year's Fruit Logistica will also be home to the first ever Global Women's Network event, which will be held on Friday, February 8. Organizers are billing the Global Women's Network as a, "platform not only to network around business opportunities but also to serve as a space for women in the fresh produce industry to get inspired, connect and be transformed into better executive leaders." February 8, the final day of the show, will be Start-Up Day, which, "addresses the numerous short- and long-term challenges facing the agricultural industry in the future" as the global population closes in on 10 billion by 2050. Held under the theme, "Disrupt Agriculture", the event will feature 10-minute presentations on innovative ideas for agriculture from young start-up companies. "We created Start-up Day as a unique, future-focused platform for the industry," said Miserius of Fruit Logistica. "The idea is to drive innovative change forward across the value chain. As the leading trade fair for the global fresh produce trade, FRUIT LOGISTICA is a perfect venue because this is where all the key industry players come together." Another feature being promoted by show organizers is the "Spotlight" icon reserved for exhibitors that are using the show to unveil new products. In terms of China, the home base of Produce Report, 67 Chinese exhibitors are present at this year's edition of Fruit Logistica. These are largely Chinese exports of products like garlic, ginger and other fresh, frozen and processed vegetables, as well as suppliers of agricultural solutions. Many of the Chinese vegetable exporters are located in Passage D of Hall 6.2, in a pavilion organized by the China Chamber of Commerce for Import and Export of Foodstuffs, Native Produce & Animal By-Products (CFNA). Another cluster of Chinese exhibitors is in Passage C of Hall 5.2, which is the same hall where two of the big Chinese importers, Goodfarmer and Joy Wing Mau, are located. The capstone to Fruit Logistica will come on February 8, when the winner of the Fruit Logistica Innovation Award is unveiled. The 10 products that have been nominated for this award will be on display in the passageway between Halls 20 and 21 for the duration of the show, and each of the expected 78,000 visitors to Fruit Logistica will have the opportunity during February 6 and 7 to cast their vote for the winner. Check back here to see who gets the big prize at Fruit Logistica 2019 in Berlin!